While mastering psychological skills of trading are is vital, it is not be itself a recipe for success. Traders must do the hard work of developing an approach that they are comfortable with and have thoroughly tested in the marketplace. This video allows traders to then look inside themselves to make sure nothing is holding them back from successful trading. 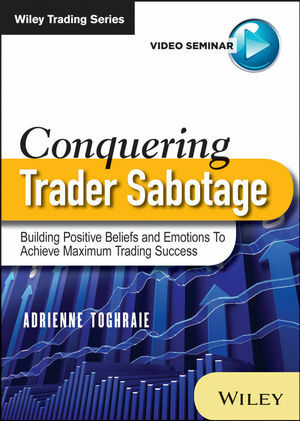 Adrienne Toghraie is an internationally recognized authority in the field of human development and a master practitioner of Neuro-Linguistic Programming (NLP) for the financial community. She is the founder and president of Trading on Target, a company dedicated to helping traders achieve a high level of success through self-help courses and individual counseling. She has provided training for many major financial institutions and organizations, including the Chicago Board of Trade, the Chicago Mercantile Exchange, the New York Mercantile Exchange, the American Association of Individual Investors, the Market Technicians Association, Online Trading Academy, OptionsXpress, amd Equis International. She has written articles for Technical Analysis of Stocks & Commodities and Futures magazines, and has spoken at numerous industry conferences. Her website is: www.tradingontarget.com. She will feature the video on www.timingthemarket.ca, a site that receives about 200,000 hits per day.